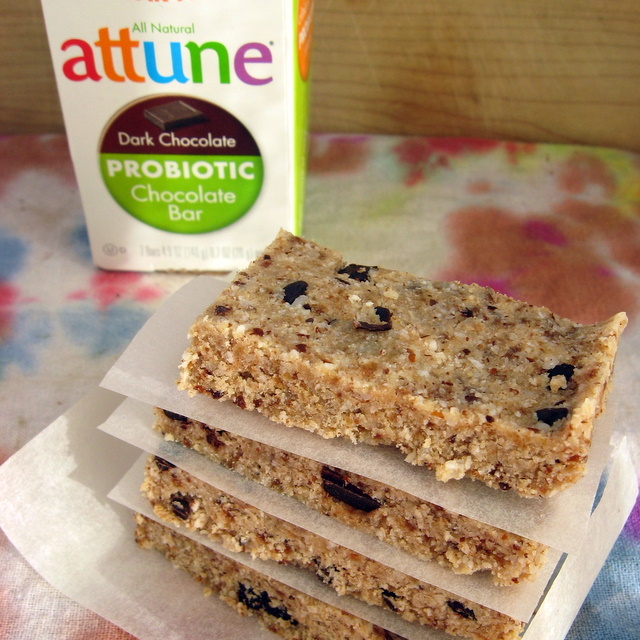 Have you heard of Attune Foods? No? That’s okay. I hadn’t either until Amy of Simply Sugar and Gluten-Free asked me if I’d like to sample some of their products, and possibly incorporate them into a recipe or two, if I liked them. Amy is a brand ambassador for Attune. Most of their products have either grains or dairy. But, they have one product – the dark chocolate probiotic bar – that is dairy-free & grain-free, and the only soy in it is soy lecithin, a soy product that I tolerate well. They’re not sugar-free, but if you’ve been paying attention around here, chocolate is the major exception to my white-sugar-free rule. Sadly, the bars are not available locally. But, Attune Foods was nice enough to send me a box to sample. Straight out of the box, they got a universal thumbs up in my household. They’re dark, but not bitter. Sweet, but not cloying. And, they’re chock full of probiotics. Probiotics are those wonderful little living organisms that our bodies need for good digestion and health, and they are most often found in fermented or cultured foods, like yogurt, sauerkraut & kombucha. Have I mentioned that I really, really wish I liked fermented foods more than I do? Because probiotics are great for you. Really. But, I’m really not a huge fan of most fermented foods. But, I can get behind chocolate probiotics. Oh yes, I can. I rarely eat chocolate straight up, though. Nope, I’m a chop it up and put it in stuff gal. But, if you bake probiotics, you kill them. All 6.1 billion of them per bar. Murderer. No one wants to be a murderer, right? Enter the unbaked coco-nut pro bars: mostly raw, full of good fats, only slightly sweet, and the perfect carrier for all those lovely little beasties in the probiotic bar. In the bowl of a food processor, process the dates and Brazil nuts until finely chopped. Add everything else except the chocolate, and process until you have a finely ground, crumbly mixture that holds together when squeezed into a ball. The amount of almond milk you need will vary depending on the moistness of your dates. Start with the smaller amount and if the mixture doesn’t hold together, add the additional milk. Add the chocolate chunks and pulse just enough to mix. Pour mixture into the prepared pan and press down firmly. Really press – if you don’t smash it down, it won’t hold together. Place pan in fridge to set. When set, remove by lifting up the parchment paper and cut into bars. Wrap tightly and store in the fridge. Looking for more slightly indulgent recipes? Be sure to check out Amy’s weekly round-up, Slightly Indulgent Tuesdays. Want more foods that promote wellness? Check out Wellness Weekends. And, for a plethora of allergy friendly recipes, visit Allergy-Free Wednesdays. For more lunch box friendly options, check out Allergy Friendly Lunchbox Love. This entry was posted in chocolate, coconut, dates, desserts, grain-free, nuts, raw, vegan and tagged bars, chocolate, grain-free, probiotics, recipes, vegan. Bookmark the permalink. Deanna! What a tasty way to get some probiotics. The coconut oil has some immune boosting properties, too. Definitely not your average cookie – you can eat these and know that you’re getting some healthy benefits. Thanks so much for a lovely review! These look amazing Deanna! I love those chocolate bars – I only wish they had more than one that was dairy-free! Pinning this! Thanks. Linked up. I’d not seen your link round up before. YUM! These look fantastic. I love the easy, go-to, nutritious snacks. Thank you for sharing this recipe this week at Allergy-Free Wednesdays! We hope to see you back again next week. Oh my these look fantastic ! I have to try these.